Paga is a mobile money platform that disrupts traditional banking products by providing financial services to 3,600 SME clients and 3.4 million product users. 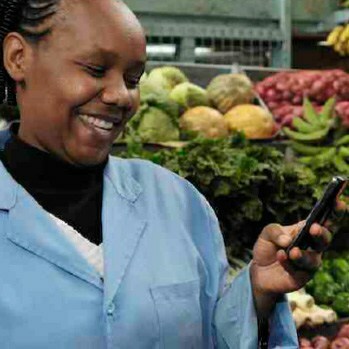 The company has revolutionised the way people pay for goods and services in Nigeria using mobile phone technology. Currently, Paga services include bill payments, airtime, money transfers as well as deposits and withdrawals. 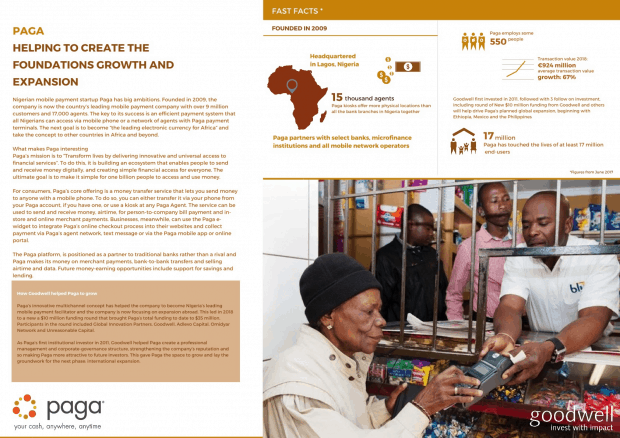 In providing financial access through its telecommunications based service, Paga is innovating new offerings for its customers through collaborations with banks, micro-finance institutions, and mobile network operators. The company aims to enhance its physical presence and was selected as a participant in Girl Effect Accelerator, a collaboration between Nike Foundation and Unreasonable Group, dedicated to benefiting girls in poverty. Goodwell views Paga as an investee that advances access to affordable payments to financially excluded populations across Nigeria. Goodwell was the first institutional investor in Paga following angel investment and helped Paga obtain several other large investments from Omidyar, Capricorn, Acumen and Adlevo, while providing nuanced micro-finance experience during its emerging stage.